ALBUQUERQUE, N.M. – Blue the dog doesn’t have a home. And he apparently doesn’t want one. 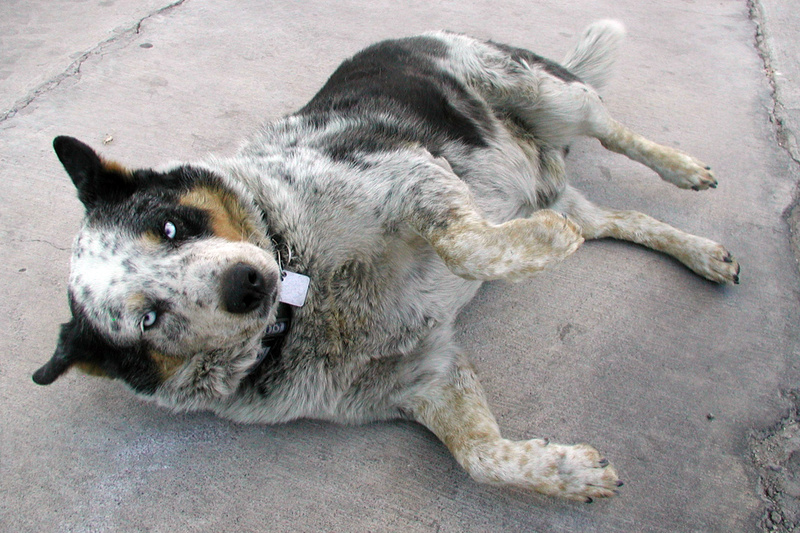 But the blue-eyed Australian cattle dog has $1,800 in savings, a Facebook page and an air-conditioned dog house. He also has a lawyer, who is working to get him an exemption from local leash laws so he can continue his free-wheeling lifestyle in southern New Mexico’s lakeside community of Elephant Butte, where he was abandoned as a puppy a decade ago. The City Council has scheduled a June 13 meeting, where supporters of Blue, who is also known as Bluedog, hope to end an impasse over his fate. Janice Conner, co-owner of Butte General Store and Marine, said it all began about 10 years ago when the dog was abandoned at Casa Taco, where Blue was cared for by the owner until he died two years ago. After that, Blue made his way to the general store, where he was fed and peacefully coexisted until last spring, when a 48-year-old woman was fatally mauled by pit bulls in nearby Truth or Consequences. After that, Conner said, a woman started complaining to the city when Blue would follow her and her dog on a nearby walking path. And this spring, Conner’s husband, Bob Owen, was cited for having Blue off-leash, prompting the legal skirmish that caught the attention of Albuquerque attorney and lake property owner Hilary Noskin. Noskin said she is working pro bono, trying to win an exemption for Blue so he can live out the rest of the years in front of the store he now calls home. City Manager Alan Briley said the city hopes to reach a compromise on Blue, but he noted that the safety of the dog and the community comes first. He said the city has received complaints about Blue snapping and growling and almost being hit by cars when he crosses the street. Conner said Blue has rebuffed several attempts at adoption, always making his way back to the store where he has become a community mascot of sorts. She said residents have dumped more than $1,800 in a jar for his care – funds she said she keeps for legal bills or medical issues. Residents have also built him a dog house with heating pads for the winter and air conditioning for the summer. “Everybody just loves this dog. People who can’t afford a dog bring their kids here to play with Blue. … He is the only dog I know who got four plates of Thanksgiving dinner at his dog house,” Conner said. Conner said she has collected more than 1,100 signatures in support of Blue, who is on Facebook as Bluedog EB-Mascot.